In an incredibly fun and accessible two-color graphic-book format, the cofounders of Honest Tea tell the story of how they built a mission-driven business. Along the way they offer a wealth of insights to entrepreneurs, would-be entrepreneurs, and millions of Honest Tea drinkers. Read the book to learn about the challenges of creating a successful business, and the importance of perseverance and problem-solving. 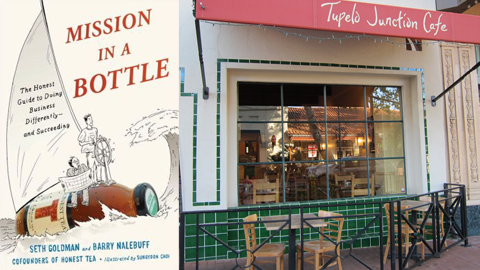 In Santa Barbara you can find the book on the front table at Granada Books, 1224 State Street. This entry was posted in Past Events on October 28, 2013 by Lisa.